Description: This Cross Pendant is easy to make and is a suitable project for beginners. 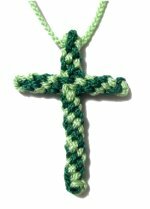 This Macrame cross is made with only two types of basic decorative knots. You can make this Micro-Macrame pendant with any type or size material, but it looks better with delicate material (1.5mm to 3mm). The example was made with 2mm Amy Braid (nylon). Cut 4 cords, each at least 36 inches long. You can use one or two colors, but the spiral pattern will be more obvious with two (light and dark). Prepare the ends with tape or glue to prevent unraveling. 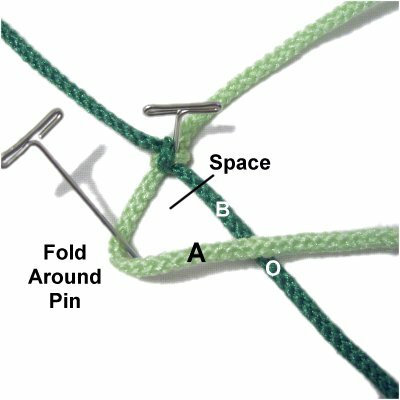 To form a base for the Crown knots, you will be tying a Linked Overhand Knot. 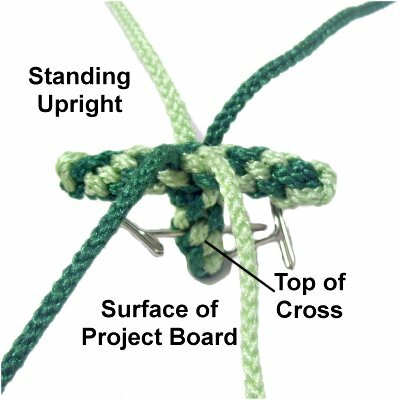 The technique chosen for the Cross Pendant is called the Shamrock knot, but a Rosendahl's Bend works well too. The cords should head in four different directions, if you prefer to start with a different knot. 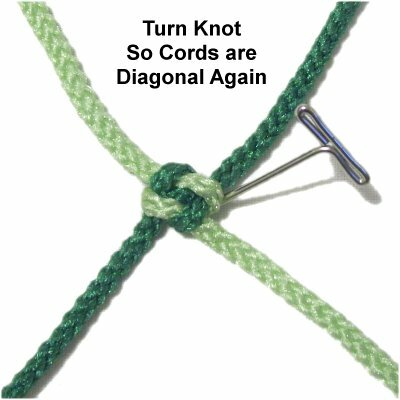 Step 1: Make an Overhand Knot in the center of one cord. The crossing point needs to be at the top. Don't tighten the knot just yet. 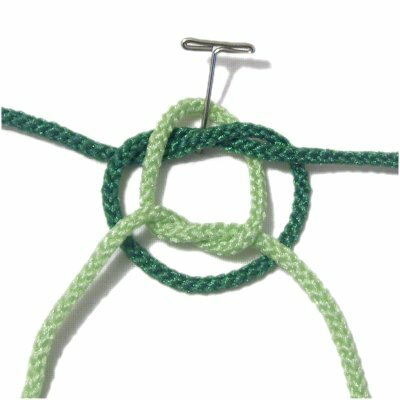 Fold another cord around a pin, balancing it so the pin is at the center. Tilt the pin backward to secure it temporarily. 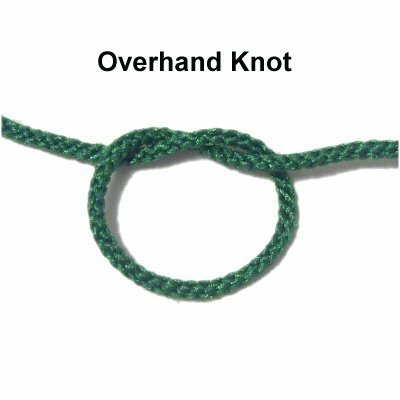 It should pass over the Overhand knot on the left and under it on the right. 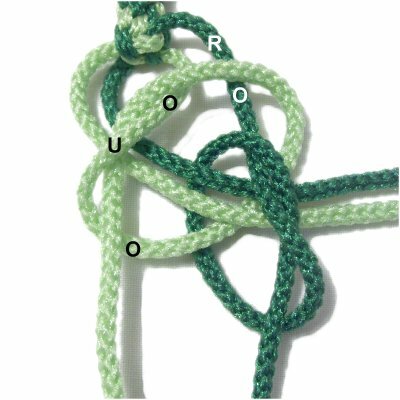 Complete the second Overhand knot with the two halves of the second cord. 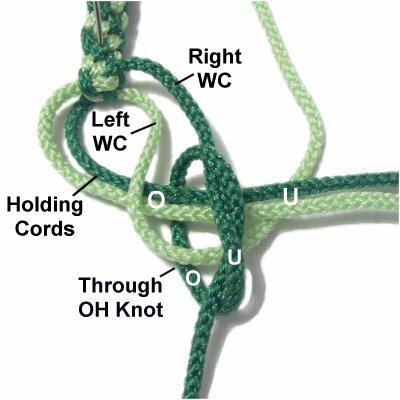 The crossing point for this knot needs to be at the bottom, and rest inside the first knot. 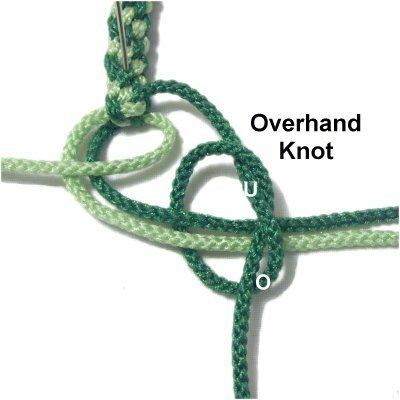 Turn the second Overhand knot sideways, so the ends are heading vertically. 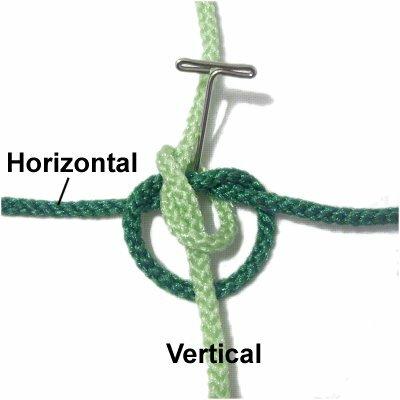 The ends of the first knot should be horizontal. 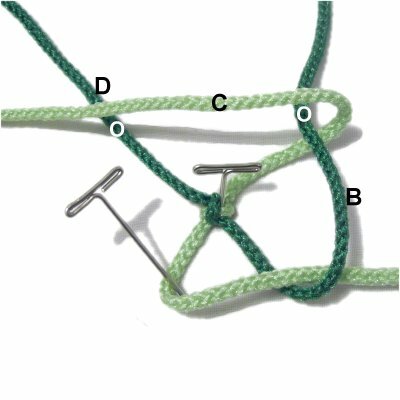 Step 2: Secure the Shamrock knot to your board, with the cords arranged in four directions. Place the design so it forms an X shape, and mentally label the four segments as shown. Designer's Tip: Every time you make this type of Crown knot, you start with the segment on the lower left. So that segment should be labeled "A". The color of that cord will alternate each time you tie a new knot, if you are using two colors. Place a pin to the right of segment A. Fold it around the pin toward the right, so it passes over segment B. Secure it to your board. The pin at the corner should remain in place for now, so there is a space. Designer's Tip: When you FOLD a cord, you don't just curve it. The cord will start out with the top surface face up. After you make the corner, the bottom surface that was touching the board will be face up. You can see this better in the images below. Fold segment B vertically, towards the back of your board. It should pass over segments A and C. Secure it to your board. Fold segment C to the left, passing over segments B and D.
Secure it to your board. Fold segment D forward (towards you), passing over segment C.
Bring it through the space at the corner of segment A, passing over - under the two parts. 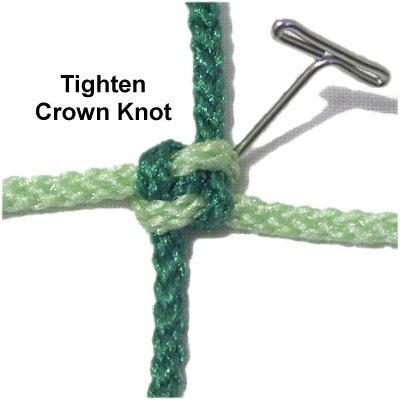 Step 3: Tighten the first Crown Knot by pulling on all four segments gradually. 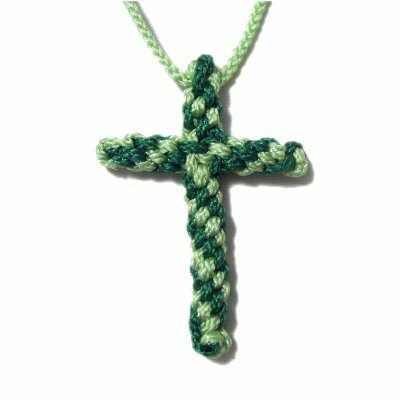 The Cross Pendant looks best if the knots are tight and small. 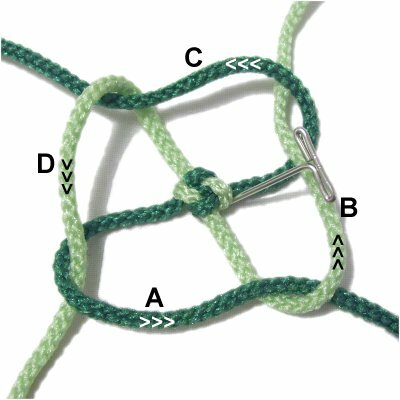 Turn the Crown Knot so the four segments are diagonal again, before you make the next one. This is the best way to make sure you start with the lower left segment each time. Securing the knot on the outside will keep it more stable on your board. Step 4: Mentally re-label the four segments, starting with the lower left (A). Repeat steps 1 - 3. 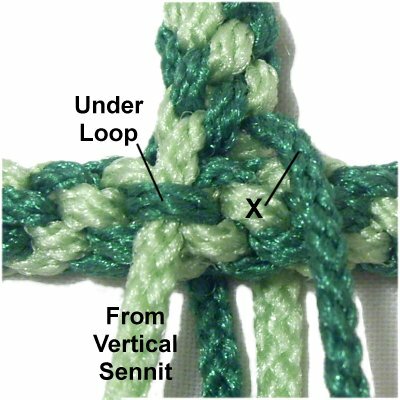 The color of segment A is the opposite of the first knot, which is what you want. Repeat steps 1 - 4 several more times, until the sennit measures 1.5 to 1.75 inches. The knots will be stacked on top of one another as you tie them, and the sennit be standing upright. Step 5: The horizontal piece for the Cross Pendant needs to be similar at both ends. 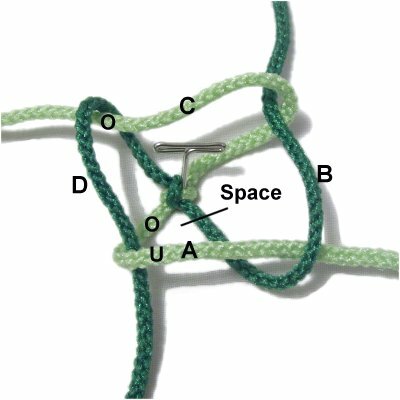 So you will now tie another Shamrock Knot, but with changes. This one is different because you have more than two cords to work with. Curve the two cords on the left to the right, and secure them. These are the holding cords. The other two cords should be vertical. 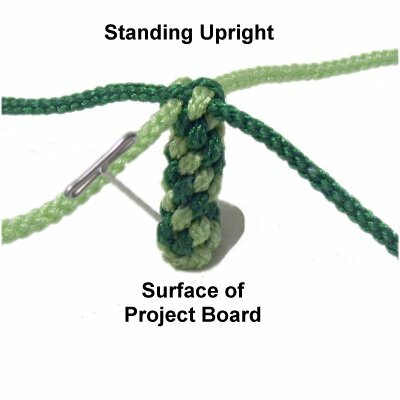 They are the working cords for the Shamrock knot. Step 6: Move the left working cord to the left, so it's out of the way. 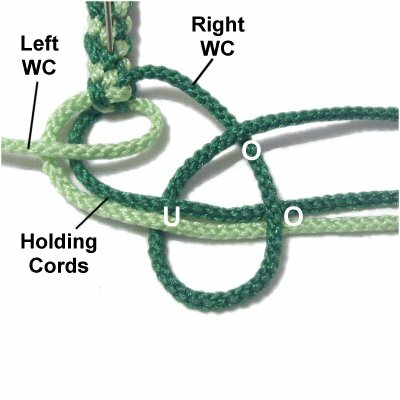 Make a clockwise loop with the right working cord (WC), passing over - under the holding cord. Pass over the working cord as you pull it right. 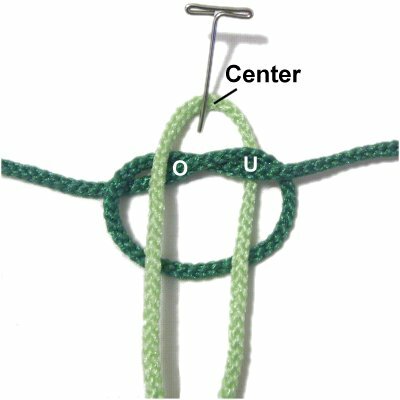 Complete the Overhand knot with the right working cord, by passing the end through the loop from below (under - over). You can tighten it a little, but leave it large enough for the next step. 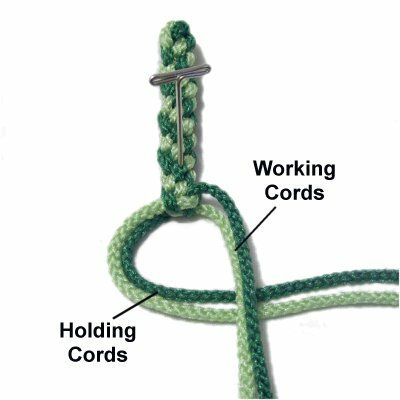 Bring the left working cord over the holding cords, to the left of the Overhand knot. Pass it through the knot, going over - under the two parts of it. Bring it under the holding cords, to the right of the Overhand knot. Move the left working cord over the right one heading left. Then bring it over - under - over the left cord to complete the Overhand knot. 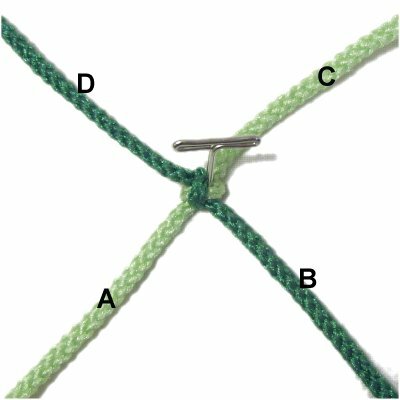 Tighten both knots firmly, making sure there is no gap between the Overhand knot and the last Crown Knot. As you tighten the right knot, apply fabric glue. When the glue is dry, cut off the excess material. You can melt the tips with a flame if using nylon or material that melts (optional). You should do a test with the scraps to see whether they melt or burn. 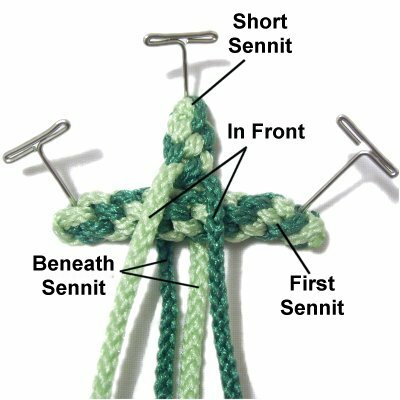 Step 7: Repeat Step 1 - 4 to make a Shamrock knot, followed by another Crown Knot sennit. Stop when the sennit is 3/4-inches long. Step 8: Secure the first sennit to your board horizontally. Place the short sennit you just made behind it, arranged vertically. Make sure it's in the center of the horizontal piece. Two cords should be in front, and the other two beneath (under) the horizontal piece, heading forward. Designer's Tip: The terms "behind" or "backward" mean that the cord or knot is heading towards the back of the board. "Forward" means it's heading towards the front of the board. Locate one of the loops at the center of the horizontal segment. "Center" applies both horizontally and vertically. 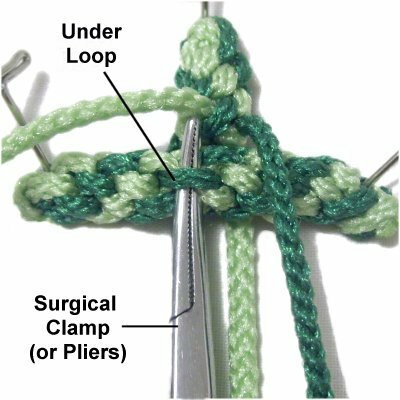 Place your surgical clamp (or pliers) under the loop. Pull the left cord coming from the vertical sennit under the loop. Use your tool again to pull the right cord under the loop indicated with an X. It is next to the left loop. Repeat the same process in the back of the Cross Pendant. Step 8, continued: Pull all 4 cords so there is no gap between the vertical and horizontal sennits. Measure the horizontal piece so there is equal length on both sides of the vertical piece. Make adjustments if needed. Step 9: Secure the top of the Cross Pendant to your board, so it's standing upright. 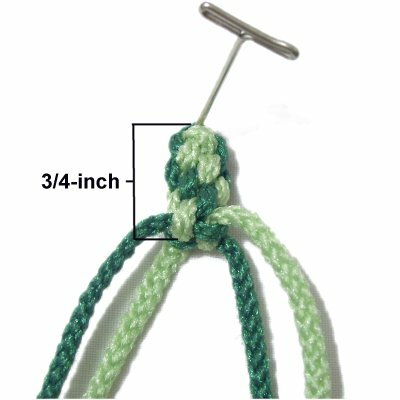 Repeat steps 2 - 4, tying more Crown Knots until the lower portion of the vertical piece is 1.5 inches long. Step 9, continued: Repeat steps 5 and 6 to make a Shamrock knot at the bottom of the vertical piece. 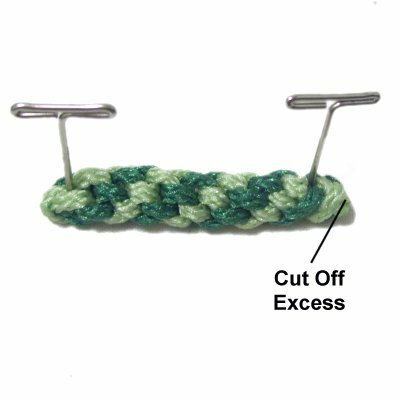 Make sure the ends are heading in the same direction after you tighten both knots. Apply glue when tightening. 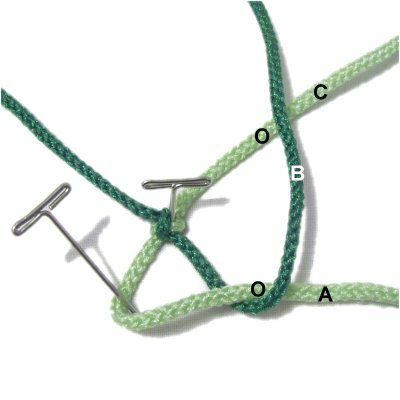 This is optional, if you prefer to use a different knot. You can add beads to the four ends, and let them dangle. You can cut off the excess material when the glue is dry. Pass one or more cords through spaces at the top of the Cross Pendant, and use them to create the necklace. Have any comments about the Cross Pendant? Contact Me.